Hockey is a game. A fun, fast-paced, emotional game. But at its core, it is also a way of life. Early morning practices, long drives to tournaments across state lines, and giving up a lot in order to gain even more somewhere down the line. Shane Prince, the Ottawa Senators' second round pick (No. 61) of the 2011 NHL Draft, especially knows this to be true. "As a kid, I always envisioned [making it]. I wasn't in hockey just for the fun of it," Prince said. "My dad was very passionate about it, and he sacrificed a lot to make me as good of a player as I could possibly be, and I obviously sacrificed a lot, too. It ended up paying off, and it's been awesome." The 22-year-old Spencerport, N.Y. native played major junior in the Ontario Hockey League with Kitchener and Ottawa. He put up 42 points in 128 games over his first two seasons, and then recorded a total of 178 points in 116 games during his final two years, finishing fourth in the OHL in scoring in 2011-12. Now playing for the Senators' American Hockey League affiliate in Binghamton, N.Y., Prince says that hunger to produce still drives him each night on the ice. 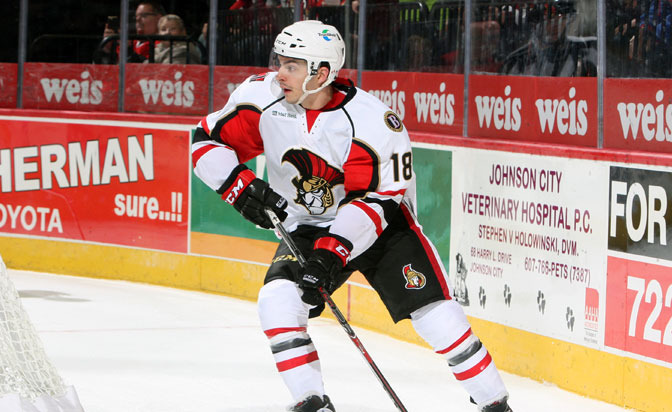 "Everyone wants to score goals, but he's really driven by scoring goals," Binghamton Senators coach Luke Richardson said. "He's a real competitor, and that's a good thing. You can coach systems, and positions, and even a little technique, but you can't coach emotion. He's got it." A quarter of the way into his third pro season, the left wing has an additional luxury not many guys playing in the AHL have: an incredible proximity to home. Spencerport sits just west of the city of Rochester, less than a three-hour car ride up the interstate from Binghamton. "I know when I go home on off days, guys tell me they wish they could do the same thing," he said. "I know I'm definitely lucky to be able to be that close to home and see my family and friends often. A lot of them come to games in Binghamton, and obviously to the games we play in Rochester." Prince, who scored his first professional goal against Rochester two years ago, has lit the lamp 47 more times since then. He enters Friday's action riding a seven-game scoring streak, and he was named CCM/AHL Player of the Week after scoring five goals and adding an assist in three games this past week. "Shane Prince tries harder than anybody. He's taken some big steps in a short time," Richardson said. "Sometimes waiting your turn is tough. But I think he's handling it very well, and that's going to give him an even better chance [to get a call up]." Life has a funny way of putting everyone exactly where he or she needs to be. Prince may have started plotting points on the map in Kitchener, but it was in Ottawa that hockey's decision-makers started connecting those dots. Prince is now plotting points in Binghamton, determined to once again make a mark in Canada's capital. Though three years can seem like an eternity, Prince is still only 22. For someone with the work ethic and commitment to improving each and every time he steps on the ice, those 267 miles between Binghamton and Ottawa aren't as vast as they may seem. "I think he's definitely taken steps to get closer [to the NHL]," Richardson said. "What I tell him always is, ‘You got to make sure you're playing your best.' You never know when that call might come. He's doing a good job to get noticed right now." Richardson himself knows a thing or two about playing in the NHL. A defenseman, he was drafted No. 7 overall in 1987 by the Toronto Maple Leafs, and played in 1,417 NHL games over 21 seasons. An Ottawa native, he too spent some time in the OHL before making the jump. His first year as a head coach with Binghamton in 2012-13 was Prince's first season in the AHL, giving Richardson the chance to see the growth from a 19-year-old kid fresh out of juniors to a player who can eventually position himself to challenge for a spot in Ottawa. "He's kind of understood that he's been in the league for a few years now," Richardson said, "and [that] he needs to take a step in the leadership role, and I've seen that this year." Richardson notes the maturity he has seen form, and the emergence of a complete, 200-foot game that is a key piece to getting a shot at the top. Prince himself echoes the same thing. "I focus on being that complete player, and I think this year I'm really coming around to that complete game," Prince said. "There are some things in this game that you can't control. It's not my decision whether I get called up or not. All I can do is kind of force the issue with playing good and bringing it hard every night."